I’d say that’s pretty good for moving as well. Good luck with your goals for the rest of this month. Thank so much – best of luck with yours! I remember buying a house and moving. The fact you did anything else during that time… You deserve an award!!!! That was very overwhelming for me from the instant we started looking until three months after being in our new home. I didn’t manage anything during those times unless it was about moving. I think you have good goals to get you back in the swing of things. 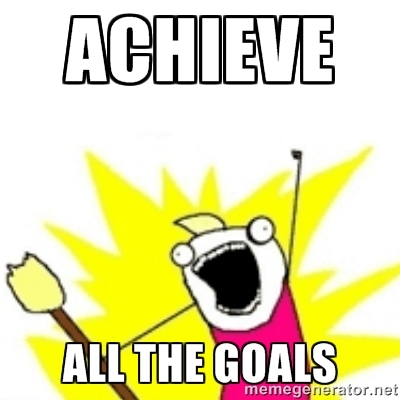 To be honest, I think I’m about to set my most ambitious goals come this weekend. I scheduled through the 17th and I’m running behind because of a surprise project. But, the ambitious goals will be the summer ones when the kids are home and life gets busier. But, I got this… I think. Best pep talk ever, Gloria. Thank you! I’ve still got two months and two weeks to be overwhelmed, it looks like. I’m so glad you commented, because I still feel like my head’s barely above water, and I was thinking, “Well, geez, The hard part’s done. Why have I not finished my novel yet? !” And I can’t wait to read your goals – love how you set them up. You definitely got this. Amazing progress in spite of that big move. Congrats on the new house. May you settle in quickly and with a sense of balance. Now those writing jumpstarts sound fascinating. How do they work? How do you decide flash or short fiction? Whichever story runs away? Love that cover for LUCKY IN LOVE . . . especially the indirect price promotion. Nice. And may you have a great week. Thank you so much, Beth! It’s a very welcoming house, so settling in shouldn’t take too much time. 🙂 And I might or might not do the jumpstarts. They’re nothing formal, I was just thinking that since I was having such a hard time picking a novel-length story to work on, something shorter might get the creativity sparked again. And thank you for the compliment on my Lucky flier! I made it over at PicMonkey–their photo-editing tools are awesome. Have a wonderful week, yourself, and thanks for visiting!